Day 6 Productions was founded in 2014 by two potters who learned about the exploding elephant poaching crisis in Africa and other parts of the world and wanted to do something to help. They focused their efforts on ceramic elephants to raise awareness of the species' plight, and funds for organizations working to help them. They named the ceramic elephants "Ellies" after their favorite toddler, Eleanor, in the hopes that there will still be wild elephants when she grows up. 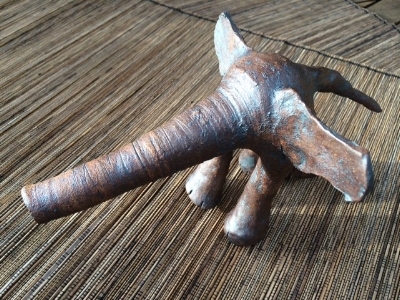 Professor I. Nelson Rose, the ceramic artist who created the first elephant for Day 6 Productions, has been working with clay for more than 15 years. He studied under Harry Berman and other instructors at Berman Ceramic Arts in southern California, also known as the Cahuenga School of Pottery. Rose is a legal consultant and Professor Emeritus at Whittier Law School in Costa Mesa, California, where he taught for 34 years. He is the author of Gambling and the Law®, and is recognized as the leading expert on gaming law. Rose’s first elephant was inspired by a bowl with human feet, more than 5,600 years old, that was found in a pyramid in Egypt. He made similar bowls, and then began adding tails, arms, and legs. He also began working with vases, adding tails, legs, and eventually, a trunk. To help him produce the elephants for Day 6 Productions, Rose works with Hamish Jackson, a production potter who got his start at Winchcombe Pottery, which is one of the oldest potteries in England. Hamish has worked at La Meridiana International School of Ceramics in Tuscany, Berman Ceramic Arts, and Brickhouse Ceramic Art Center in Long Island City, New York. Since 2015, he has been an apprentice with Mark Hewitt in North Carolina. His work is typically more functional, but he enjoys the challenge of creating sculptural work. The elephant who started it all.